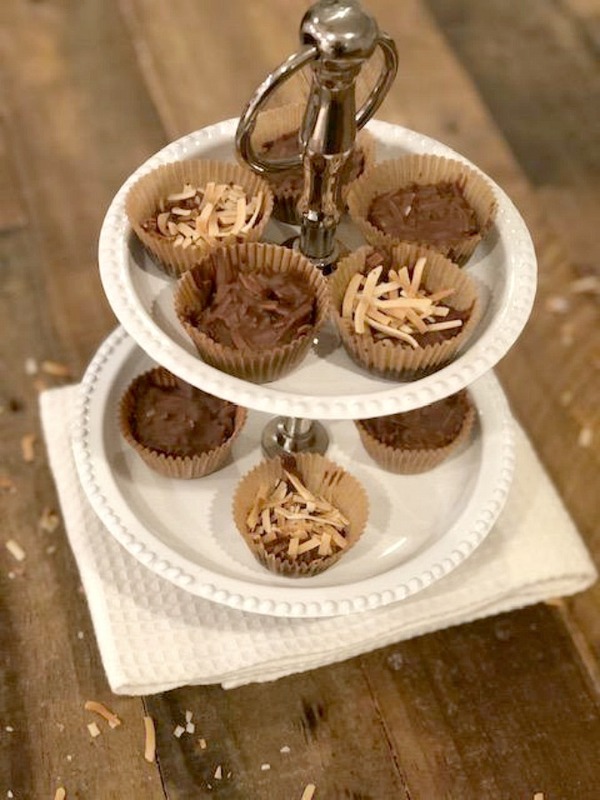 Milk Chocolate Toasted Coconut Clusters – This is the easiest recipe for the most rich tasting chocolate cluster. 3 Ingredients is all it takes for deliciousness. Enjoy! You know those big candy boxes that have all the different kinds of milk and dark chocolates in them? They are those large white boxes with the big bow around them or the big heart shaped ones around Valentines Day. Well, my all time favorite candy inside those boxes were the milk chocolate ones with the toasted coconut showing through the top. I loved those so much. I love any chocolate, especially milk chocolate so those were and still are the ones I grab as fast as I can when the box is opened. I guess I don’t really have to worry about getting that yummy piece of chocolate anymore. This recipe is so easy I can make it anytime I want. My whole family loves these too. Even my daughter Tori who thought she didn’t like coconut loves these. 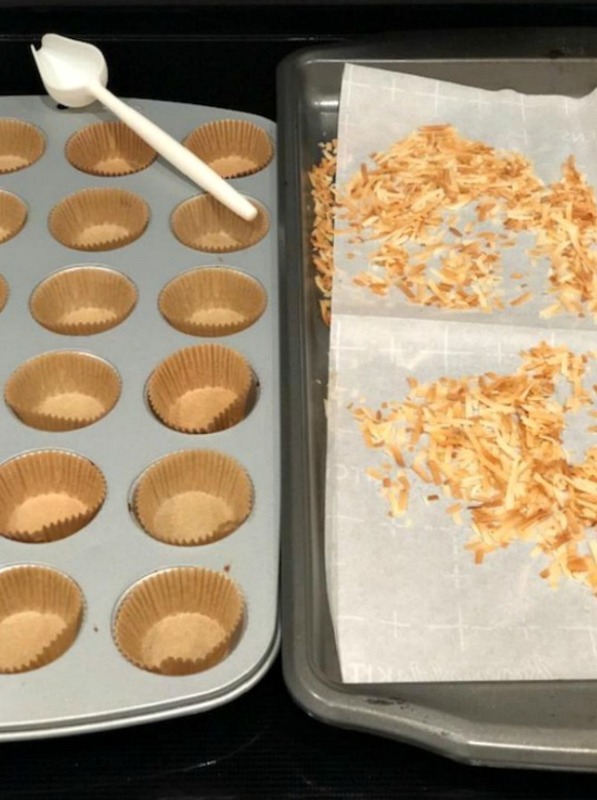 I think it’s the toasted coconut part. There is something about the aroma and taste of toasted coconut. 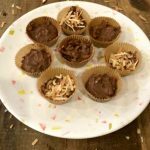 If you haven’t tried it, you should and then make these little gems. You are sure to love them too! 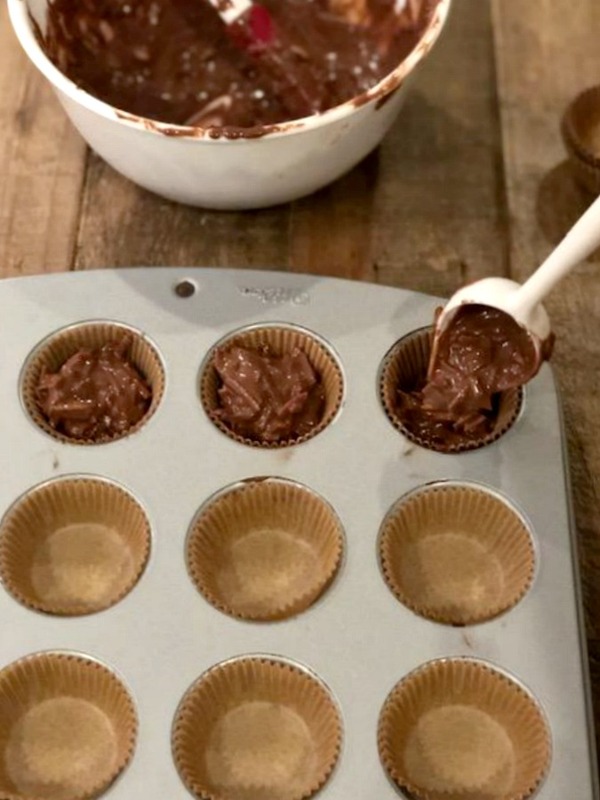 Have a mini muffin pan lined with paper liners. Set aside until ready to fill. Preheat oven to 325 degrees, line a cookie sheet with parchment paper and spread coconut in a single layer, use two sheets if needed. Toast in oven for about 8 minutes, rotate pan after 4 minutes and shake pan gently. Check after 6 minutes to see that the coconut is not burned. You want it looking toasted and slightly brown, but not too dark. When finished, take out of the oven and let cool right on the cookie sheet. 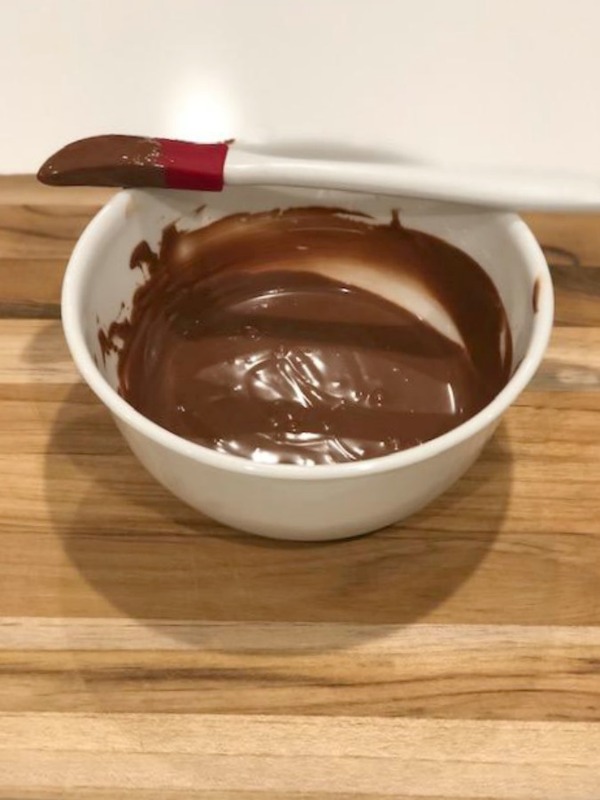 Melt the chocolate in a double boiler under simmering water. Add oil before the chocolate is melted. Keep stirring until chocolate is shiny and melted. Take off the heat and stir again to cool down just a bit. 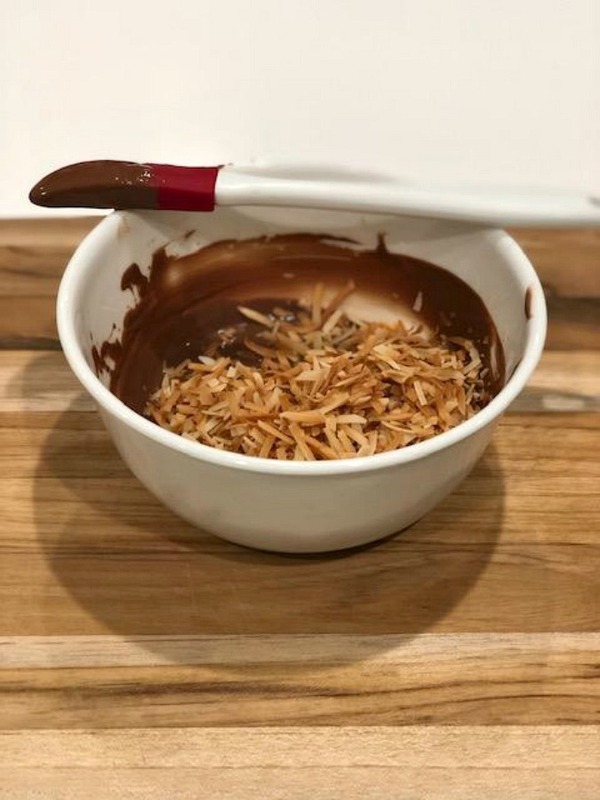 Gently toss the coconut into the chocolate mixture. Combine completely and dollop into each mini muffin cup until all are filled. Tap the pan just a little to remove any air bubbles. Sprinkle any extra toasted coconut over some of the clusters. Place in fridge for about 30 minutes until set. Keep in fridge up to 5 days in an airtight container. 1.Have a mini muffin pan lined with paper liners. Set aside until ready to fill. 2.Preheat oven to 325 degrees, line a cookie sheet with parchment paper and spread coconut in a single layer, use two sheets if needed. Toast in oven for about 8 minutes, rotate pan after 4 minutes and shake pan gently. Check after 6 minutes to see that the coconut is not burned. You want it looking toasted and slightly brown, but not too dark. When finished, take out of the oven and let cool right on the cookie sheet. 3.Melt the chocolate in a double boiler under simmering water. Add oil before the chocolate is melted. 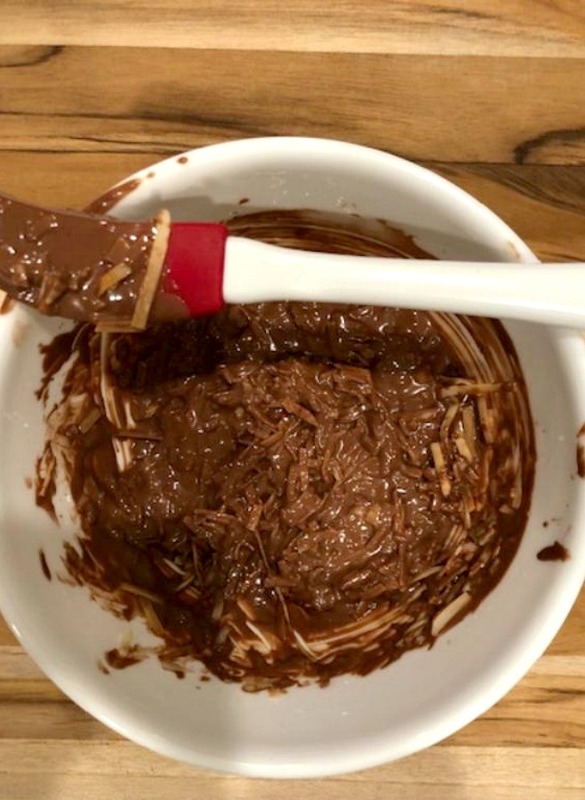 Keep stirring until chocolate is shiny and melted. Take off the heat and stir again to cool down just a bit. 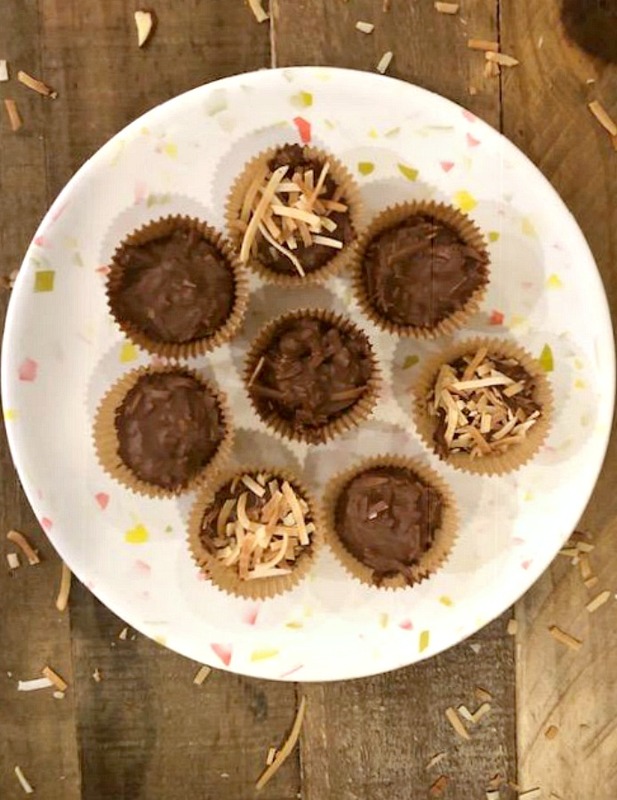 4.Gently toss the coconut into the chocolate mixture. Combine completely and dollop into each mini muffin cup until all are filled. Tap the pan just a little to remove any air bubbles. 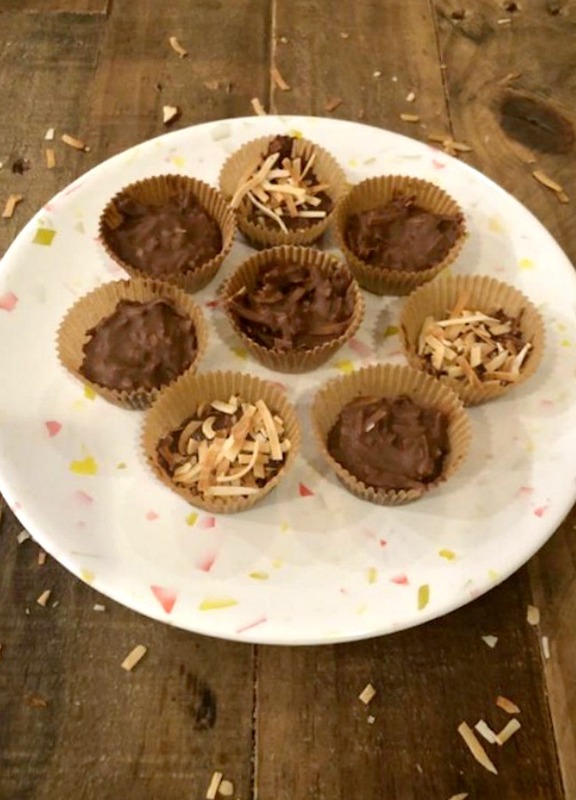 Sprinkle any extra toasted coconut over some of the clusters. Place in fridge for about 30 minutes until set. Keep in fridge up to 5 days in an airtight container. Enjoy!